Paul Ryan has had enough. 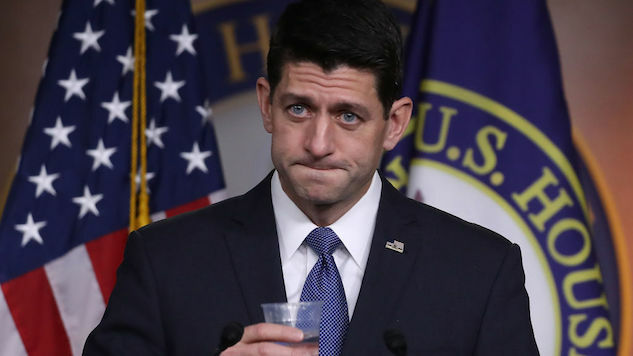 An extensive report from Politico has revealed that current House Speaker Paul Ryan has expressed a desire to leave politics behind and be a stay-at-home dad. Politico cites numerous Ryan friends and colleagues, saying that there are several reasons behind Ryan’s decision, including the fact that he believes he can achieves his two primary political goals this year, but that the main one was that he didn’t want to share a ticket with Donald Trump come 2020. Ryan came into politics with two express goals: rewrite the tax code and cut entitlement spending. Those are, for real, the only two things he cares about. Republicans are already celebrating a tax reform bill that gives money away hand over fist to corporations and the wealthy while making it harder for poor people to receive healthcare, and Ryan is going to try for entitlement “reform” sometime next year. Once he accomplishes this other goal, which would likely involve making more vital government services unavailable to the marginalized and impoverished, Politico reports that he plans to retire at the end of 2018. But Politico does give several reasons why Ryan’s job as Speaker for the House is a burden, chief among them the large number of “can’t-fail” bills he has to pass in January and February of next year. Paul Ryan has been beloved by his constituents and corporate overlords since he was first elected to the House in 1998. A huge fan of deregulation and cutting spending, Ryan has long been an advocate of taking aid away from poor people and letting wealthy corporations just do whatever they want. He is known for being the vice presidential candidate in Mitt Romney’s failed 2012 presidential bid, and for endorsing Donald Trump for president after saying for months that he would never do so. After nearly two decades of trying to punish poor people for being poor, Ryan purportedly wants to spend time with his children before they go off to college. He has threatened to retire before (after the aforementioned defeat in 2012), and as in most other things, he wimped out. He never wanted the Speaker position, but he took it anyway, and he never wanted to endorse Donald Trump, but he did that, too. Ryan is a figure who represents both the Republicans’ failure to reject Trumpism from taking over their party and Republicans’ endless quest to make corporations wealthier than they already are. The one thing he is truly talented at is fundraising for the GOP, a party which has done nothing in the past few years but wage war on America’s poor and marginalized. He is and has always been a coward who has done nothing but lower the overall quality of life in the United States of America. His retirement would be good news, if it turns out to be true and not just another whiny attempt to flee from what his own party created.